Mr AG, Isn't Maran Money Laundering Threat to National Security? Mr Attorney, You Got Facts, Law Right on Marans? It has been the long-held view of the Telecom Ministry itself that illegal telephone exchanges are a grave threat to national security? The report says the DMK minister got 323 BSNL lines fraudulently connected from his home to the SUN TV office in 2007. As Narendra Modi took over as Prime Minister three biggest challenges confronted him from day one. One, demonisation of him by the media and others abroad. 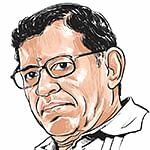 Will the Finance Minister do what 'Works in and for India'? How to Handle UPA's Financial Landmines? The intuitive habit of drawing macroeconomic conclusions (about India) from the corporate feedback (and vice versa) is fraught with risk. Will Budget Look Beyond Corporate Sector? Modi government has perhaps aroused the highest expectations of people – the kind of aspiration not easy for any government to satisfy.